I am back with yet another recipe for my upcoming shindig! I have still stuck with making each dish only a bite sized tasting – yes..even the dessert! 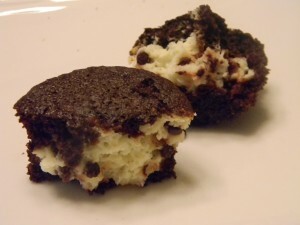 This recipe was so delicious that I wish I had had extra to make an entire cheesecake out of rather than these little bite sized versions. 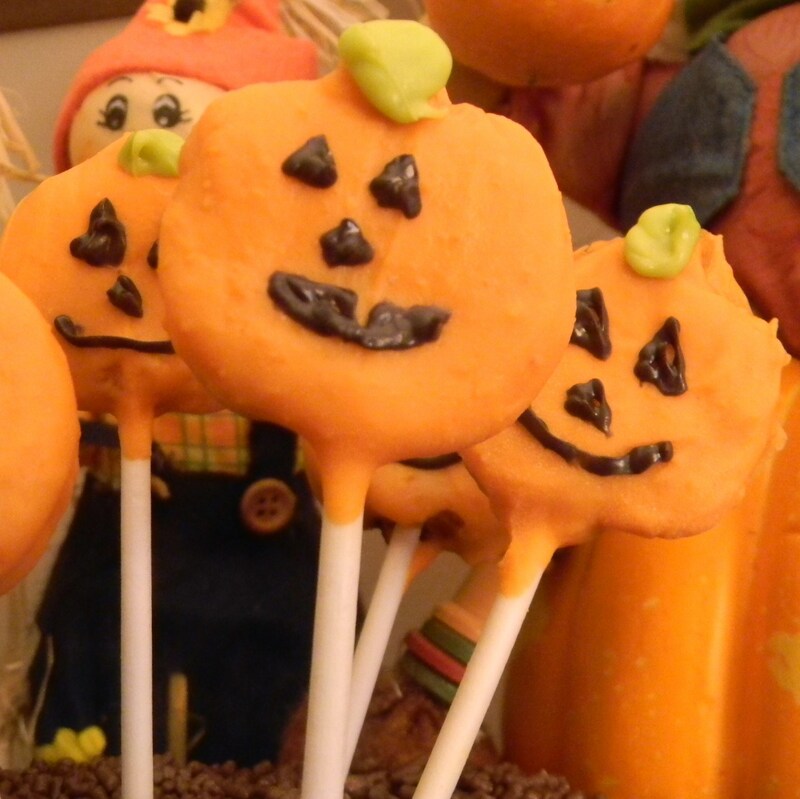 This is a different variation of a cake pop – only this time its with cheesecake. Feel free to use whatever cheesecake recipe you have to do this, just omit the crust. 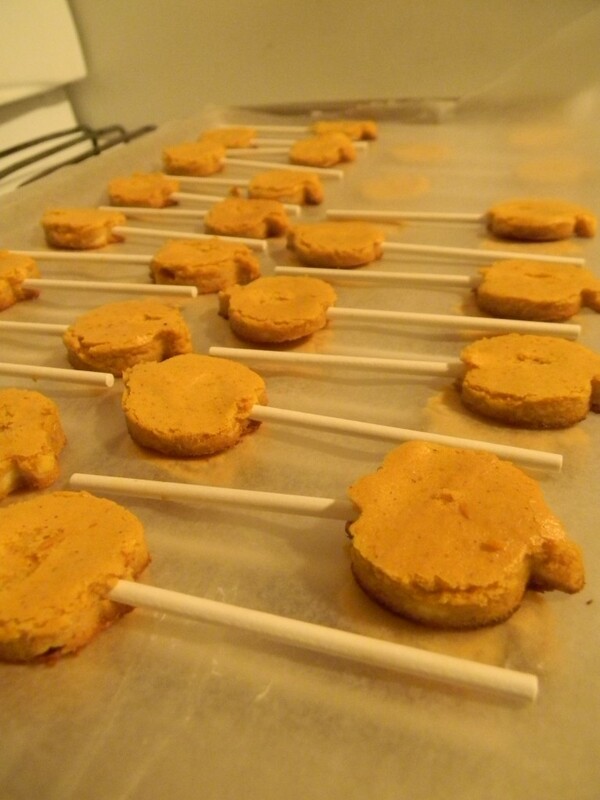 I tried to stick with a recipe that was more dense than fluffy since I was going to put them on a stick. I used this recipe I found on the internets Simply Recipes: Pumpkin Cheesecake. Recipe calls for bourbon, I didn’t have any so I didnt use it. I also used an extra heaping tablespoon of flour to assure the cheesecake was strong enough to stay on sticks. Combine all ingredients together with a hand mixer to assure its creamed very well. In a high sided cookie sheet, line the bottom with wax paper and to be safe you can even spray that with a baking release spray. Set oven to 325º and cook until a toothpick comes out clean. It took me a little bit over 30 minutes. Let this cool completely!! When it is cooled completely use a small cookie cutter or round cutter about the size of a silver dollar and stick with a popsicle stick. The thicker you made your batter, the bigger you can cookie cut these out. My mixture was thinner so I made sure to not make them too big. Add to another sheet pan lined with wax paper and freeze overnight. Time for the dunking! 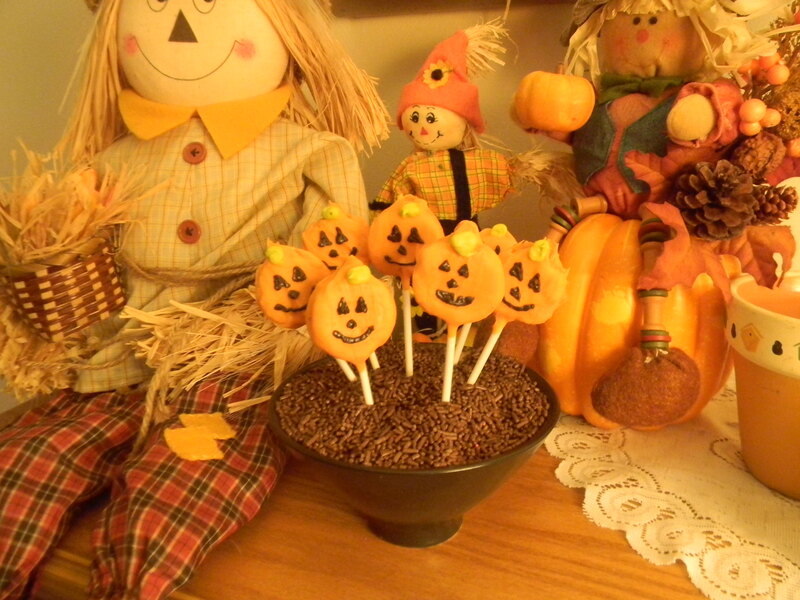 I used Wiltons Candy melts in orange. I find it so much easier to get the pre-dyed stuff and not have to worry about the chocolate turning into a gross mass of useless-ness. 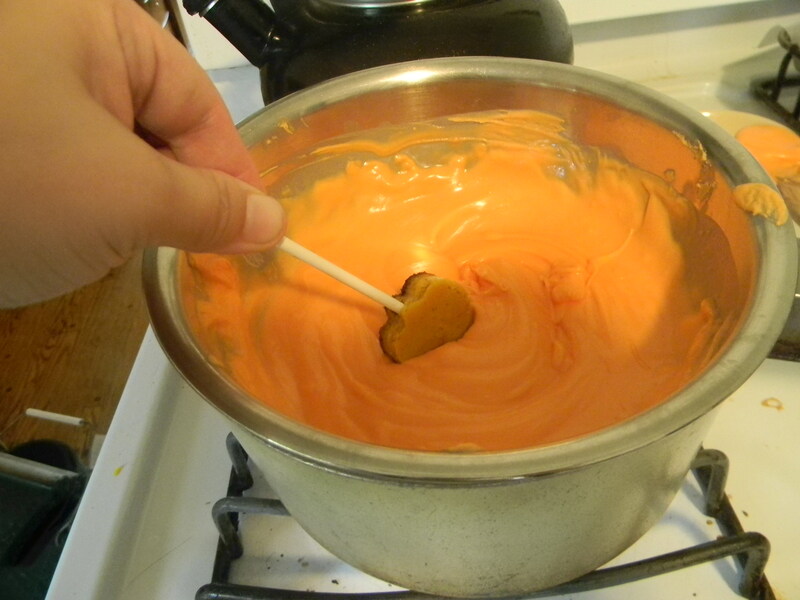 Using a double boiler, get the candy melts melted and smooth. I did have to use a few spoonfuls of vegetable oil to get the perfect consistency. I am proud to admit I did not lose any lollipops to the melty goodness. I do wish I had though, cause then that means I would get to eat it and not feel bad about it. Everyone knows cheesecake that falls off a stick loses all its caloric values. Conefession – I ate one anyway. Back to the wax paper lined cookie sheet they go. 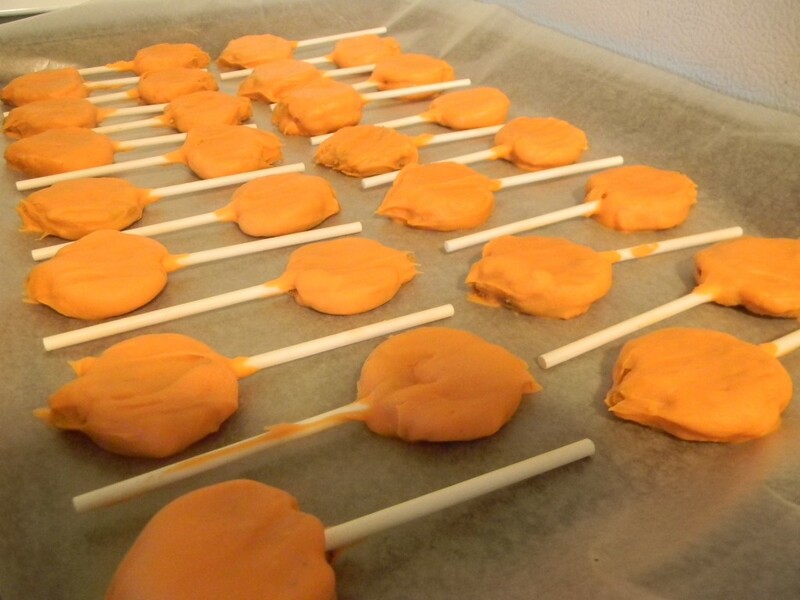 Good thing about candy melts – they dry really fast! 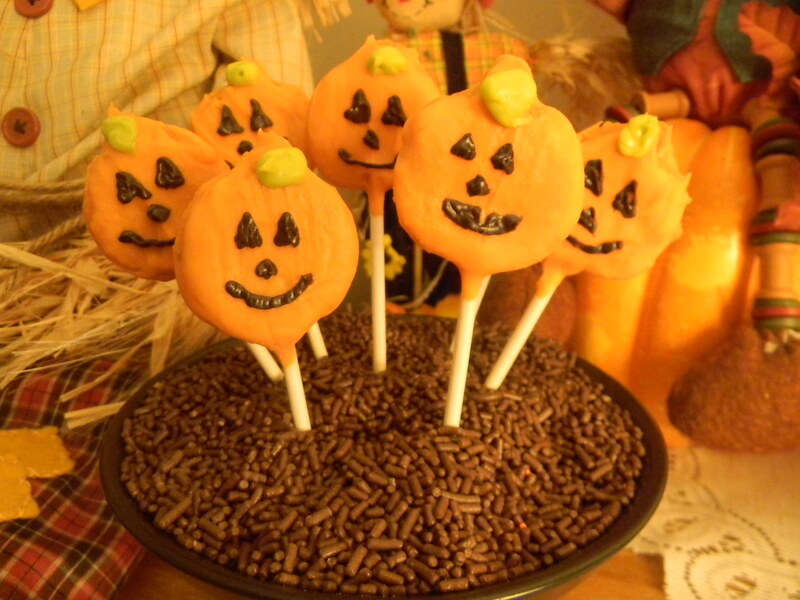 In a piping bag I added green candy melts and black and decorated them like mini jack-o-lanterns. Here was my final result! Cuteness Overload! 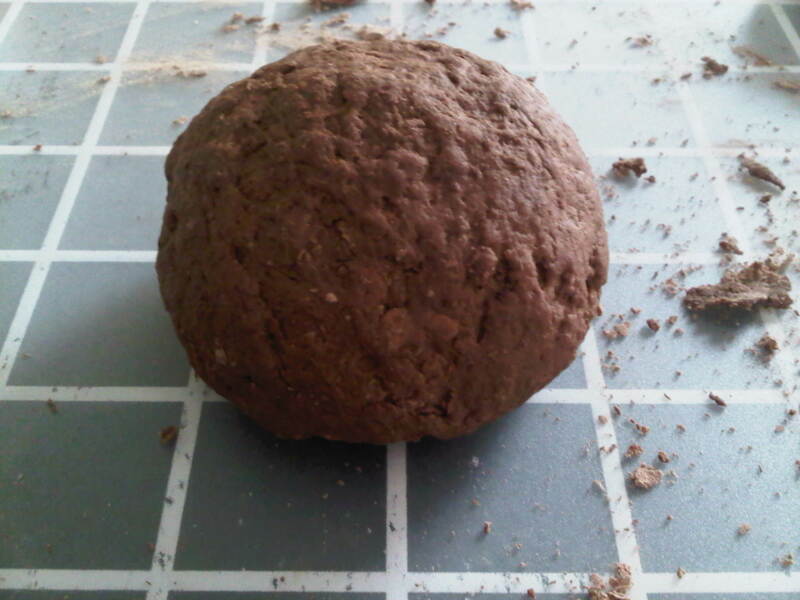 Also, Check out this awesome video about how to make a spider bread boule! I found it last year and I still love it. I am going to fill my spider with creamy spinach and artichoke dip! 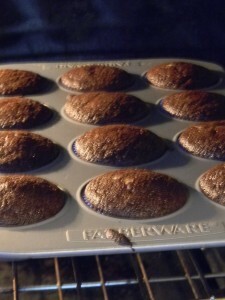 Preheat oven to 350°F and line a muffin pan with cupcake liners. Place chocolate and cocoa in a medium bowl and pour hot coffee over the mixture. Whisk until smooth and transfer to the refrigerator to cool completely, 20-30 minutes. Fill each cupcake liner about 1/3 of the way full. Add about a tablespoon-size scoop of cheesecake mixture, then spoon more cupcake batter over the top until cheesecake is covered and the liner is filled about 3/4 of the way full. 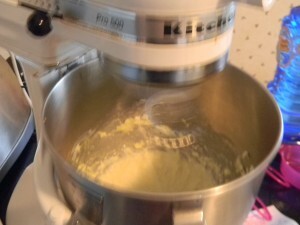 To prepare the buttercream frosting, beat butter and shortening in a large bowl until light and fluffy. Add vanilla and salt. Beat in confectioners’ sugar, 1 cup at a time, scraping down sides of the bowl. Add 2 tablespoons of milk; beat at high speed until light and fluffy. Add additional milk for desired consistency. I got to baking, crossing my fingers that this recipe would work. Unfortunately I didn’t cross my fingers when I thought to myself “of course I have all the items to make these!” I didn’t have flour. Fail. I used whole wheat flour instead. “But there’s no sense crying over every mistake. I waited patiently. . .
And the moment of truth. . . They were absolutly amazing. It isn’t often that I put a recipe into my ‘forever vault’, but these made the cut. This recipe is rock solid! They baked beautifully and evenly. I was worried about the entire thing baking and finishing at the same time with two types of batter, but they did! I was concerned that the filling may sink to the bottom but all was well, I was GLaD! I know only my fellow geeks would understand this cake ( and most likely a majority of this post…) but here was my finished result! 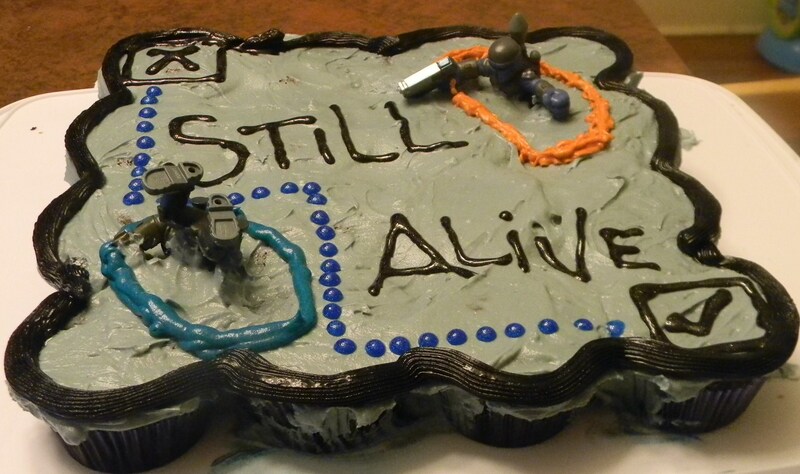 My portal cake was a success and my gamer geek was very happy! For your viewing pleasure. . . I am sure nobody believes me anymore when I say I hate baking. It seems I keep on having at least one baking post a week, seriously people..I don’t like it! Here was my dilemma, I saw some gorgeous Rainier Cherries and I had to have them. My usual routine when I pick up cherries is I fork out all this money for a nice organic bag of rainier or bing cherries, then I decide it’s way too hard to eat something with a pit as a snack at work, especially in food service. Apparently people in food service frown upon sticking your fingers in your mouth to retrieve a pit or spitting them out, go figure? The only choice in the matter here was to eat them at home or bake with them. Of course being the over achiever I am, I did not settle on one bag of cherries, but two. So what’s a girl to do with 4 lbs of cherries?! The first plan was to just make cobbler. Easy enough, not too much flour interaction – I can deal with that. Then I decided I no longer wanted to do cobbler, and pie was out of the question (not a pie fan). I was craving that buttery crust of a cookie bar. I looked up some recipes on fruit bars and this is the hybrid I came up with. It was an on again off again rainy day outside so I also was able to turn this into a cooking project for my 4 year old niece Kaileigh. First, make the filling so it has enough time to gel up and cool off. 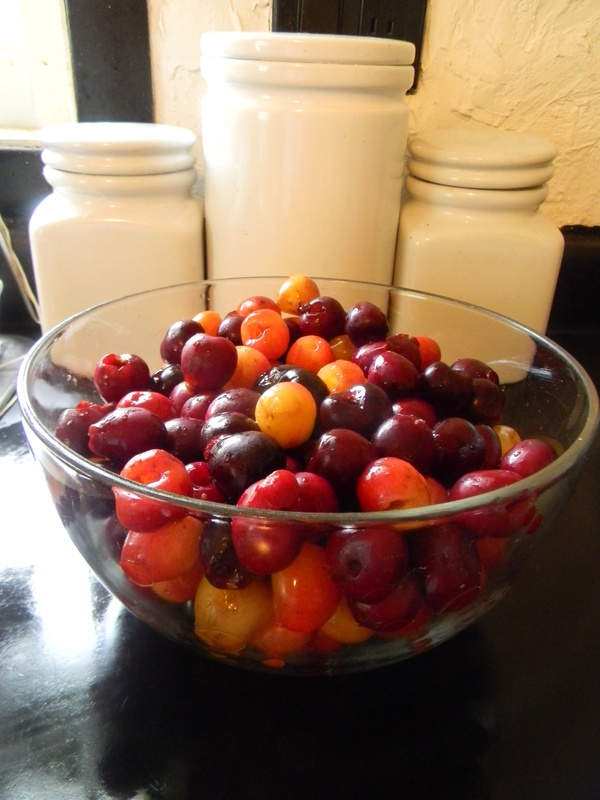 I pitted all the cherries while the niece was taking a nap, I barely had the patience to pit all of those, there’s no way a 4 year old would keep interested in pitting 4 lbs of cherries. I do use a cherry pitter I found for only about 5 bucks at target, if you don’t have one – then I wish you luck. In a big high sided sauce pan, melt half a stick of butter, add all the cherries, white sugar, brown sugar, almond extract and let simmer until it thickens, this can take about 20-30 minutes – just leave it alone you don’t have to constantly watch it. I had corn starch handy in case it didn’t thicken, but I guess all it takes is patience – it really works! Set aside to cool. Next make the bottom crust. Set the oven to 350º. Combine flour, sugar, cold butter, and salt. Mix together just as you would a pie dough. Cut the butter with a fork or smash very well between your fingers until it’s course balls of dough. Add almond extract and milk until a soft dough forms. It should still sort of crumble if you smash it in your hands, it’s not meant to be a rollable dough. Next, line a pan in parchment. I did make this to be a big recipe so that I could fit in in a high sided cookie sheet. Press the dough evenly across the pan. Bake at 350º for about 10-12 minutes, just to start the cooking process. If your butter has begun to melt while pressing into the pan, chill it before baking so it comes together and the butter doesn’t puddle. While the bottom crust is baking, begin making the crumb topping. Combine just as you did the bottom crust, only this time it needs to be more crumbly than the bottom crust was. It’s nearly identical in ingredients (aside from the egg), just different amounts. I did add some brown sugar just because I wanted a nice crunchy sugary topping. 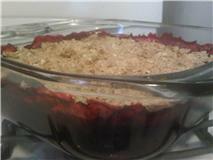 Once the bottom crust is done, add the cherries to the top, and crumble the crumb topping evenly across the top. Bake at 350º for about 25 minutes, until the top crumb coating is cooked through. 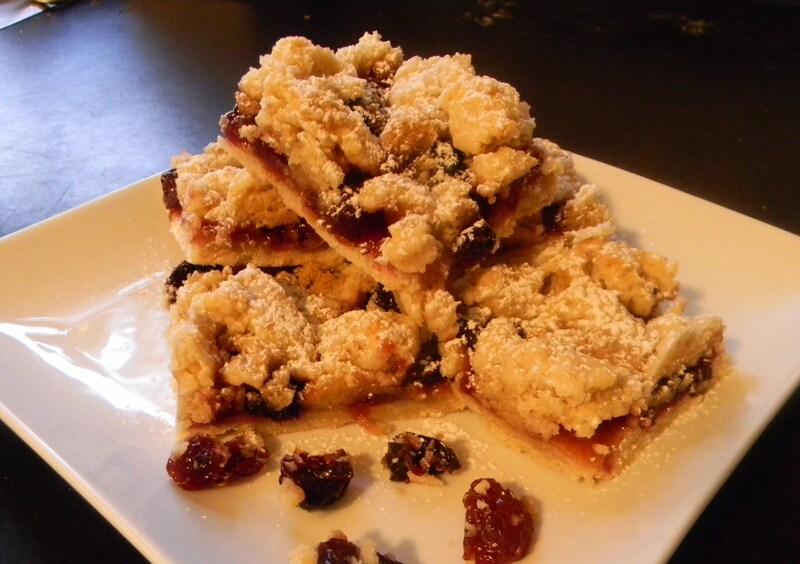 Top with a garnish of your choice, I did slivered almonds and powdered sugar. This became Monday nights dinner. Bacon, it seems to be in everything lately. 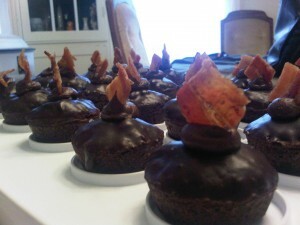 Bacon salt, bacon soap, bacon chocolate, bacon sundaes. The world is on bacon overload right now and i’m fully aware of this. This does not however make me think that bacon is overrated and just a passing fad. Bacon is delicious! I wanted to make a bacon cupcake and I was not thrilled with the recipes I had found. I had to think about how to create my own bacon cupcake recipe. This was my adventure! I was in charge of creating a dinner fit for my BBQ team over the weekend. I thought what better than to make a BBQ themed dessert with it. I looked up bacon cupcake recipes and it seemed to me that all of them were very frosting-heavy, and the cupcake itself seemed too fluffy, like a normal cupcake would be. When I think of adding something savory to something sweet I don’t think of fluffy. In my mind I was picturing a dense, fudgy, chocolatey cake, sort of like how most gluten free cakes come out. I quickly realized I was going to have to create this recipe on my own. Which, from reading one of my previous posts you should know I HATE baking. I don’t know the science behind it! I thought of this recipe I had found in a cooking magazine around Christmas time. It was the perfect batter for what I was picturing. My main reason for loving this recipe is that the eggs are tempered in on a double boiler. This allows me to cook the eggs out so that when I go to back the cupcakes I can sort of ”under bake” them which results in a gooey brownie batter texture – amazing! 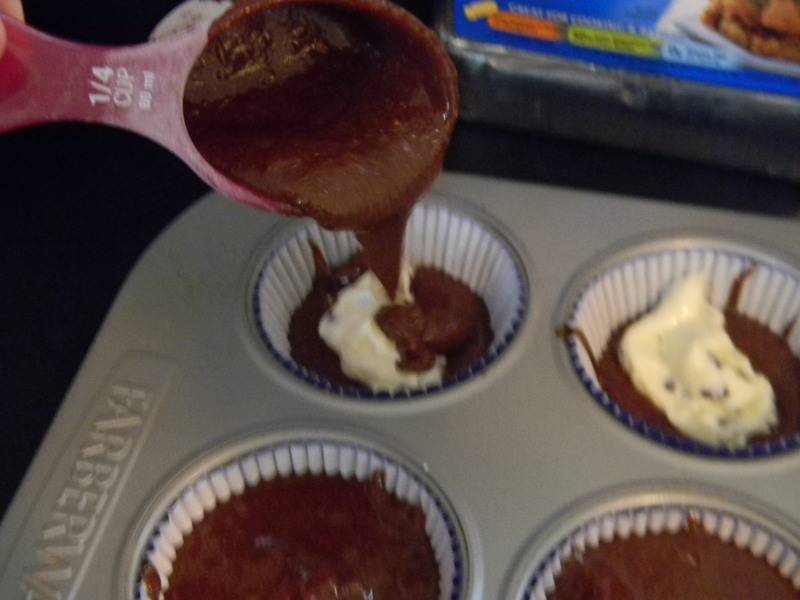 I had my plan set, I was going to take that recipe and sort of tweak it to become a chocolate bacon cupcake. I took two pounds of bacon and lined them up on a sheet pan and put them in the oven until perfectly crisp. I needed to do this first because my brilliant idea was to take the bacon fat and use that instead of butter. Brilliant, I know. Once the bacon was ready to be taken out I added the bacon fat and unsweetened chocolate squares to a double boiler. I got my eggs ready to temper in. This is when disaster struck – or so I thought. I was tempering in my eggs and everything seemed to be going great until the last egg. My batter completely broke. You know how when even the smallest of drop of water gets added to melted chocolate and it stiffens up into this weird mass? That’s exactly what happened. My friend and I stood staring at the pot wondering how the heck we were going to fix this. We were so excited to see the final results of these cupcakes and this shattered our hopes and dreams (we don’t aim high..). I had this weird baking epiphany, I need to add sugar still, and sugar melts. If I melt the sugar, will it be enough liquid to make this happy again? Who knows, to me the batter was already a fail it certainly couldn’t hurt. I added my sugar and kept mixing while making a hopeful pouty face. To my surprise, it worked! The batter was gooey and melty again and I no longer felt like a baking failure. Since I did use bacon fat instead of butter the batter did keep separating a bit. I added some finely chopped bacon bits and flour. Once I added the flour it came together pretty well. I got them into mini baking cups as quickly as possible. I only baked them for all of 8-10 minutes, because my favorite part of this batter is the gooey center I get when they aren’t fully cooked, which is okay because my eggs are cooked in the double boiler already. I took the cupcakes out to cool and made a hard ganache. 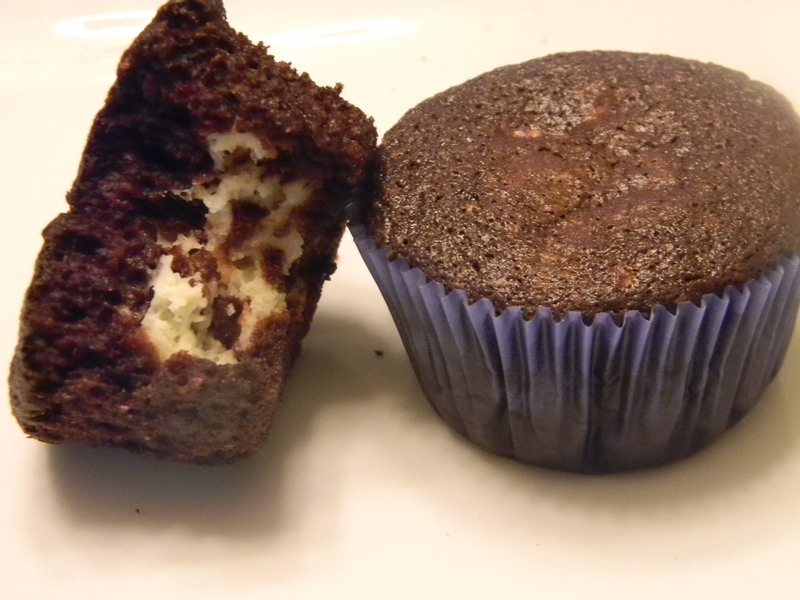 I dipped the tops of the cupcakes in and let those harden. 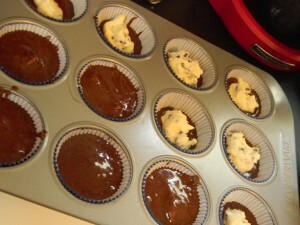 I then added a dollop of chocolate frosting (store bought, I had to cut a corner somwhere!) 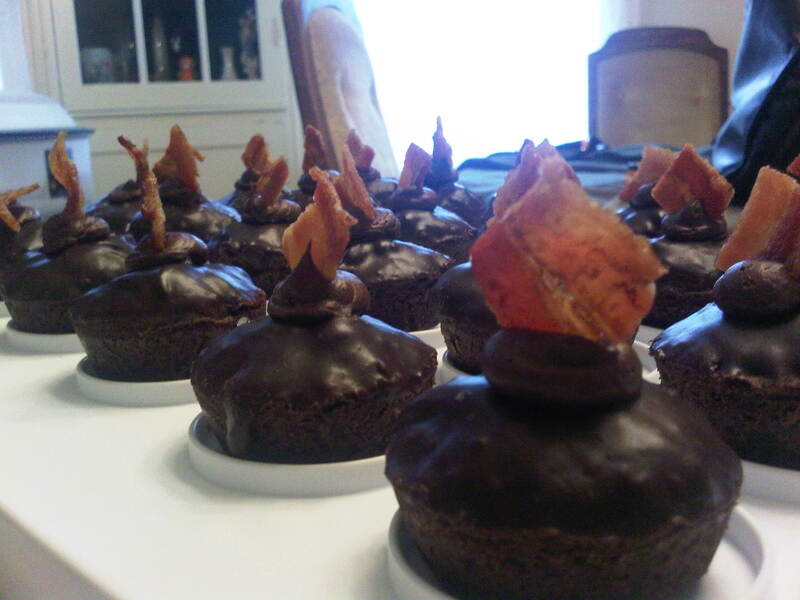 and then I topped each cupcake with a perfect square of crisp bacon. I also couldn’t resist topping each cupcake with a few flakes of sea salt. These were one of the most incredible small-bite desserts I’ve ever had. They were tiny two-biter cupcakes that had so many layers of flavor. Chocolatey, smokey, salty, sweet. 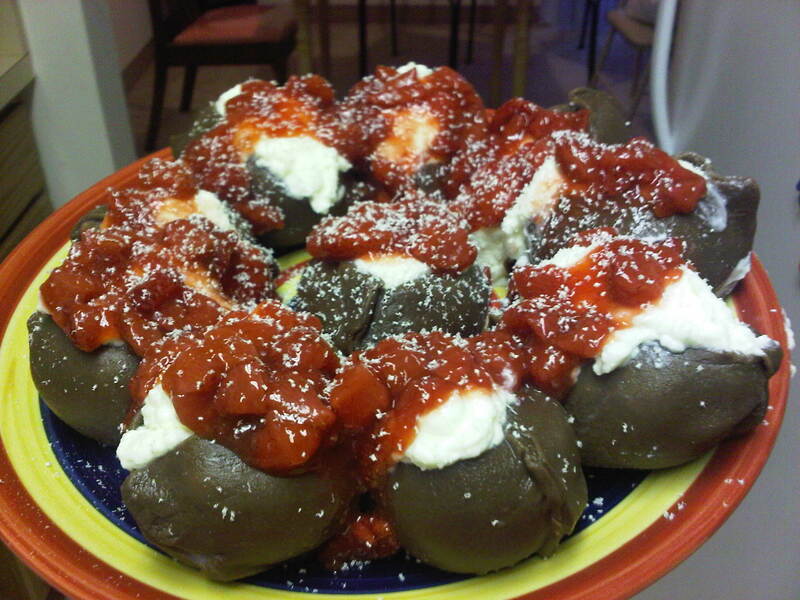 Stuffed Shells – As a dessert? Yes people! Believe it or not I made this happen! My friend Mel decided to have a throwdown for stuffed shells. She “claims” she makes the absolute best ( 😉 just kidding Mel, they rule! ) so she challenged all of us to try to beat her famous stuffed shells. I usually don’t get very adventurous with my stuffed shells. I’ve always stuck to the basics – buying shells, ricotta, some seasonings, baked with mozzarella cheese and Parmesan. They are pretty tasty but I didn’t feel it was throw down material. As I thought about different variations such as adding sausage, or grilled veggies, or seafood I had an epiphany – can I somehow turn this into a dessert? I started thinking of all the possibilities. 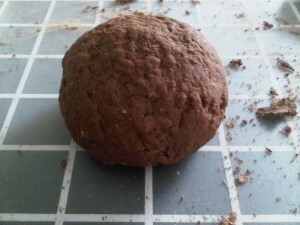 I knew I had seen chocolate pasta dough before – but I wasn’t so sure how the pasta texture would work. I thought of making a shell out of chocolate – but then thought Mel would definitely say I cheated. 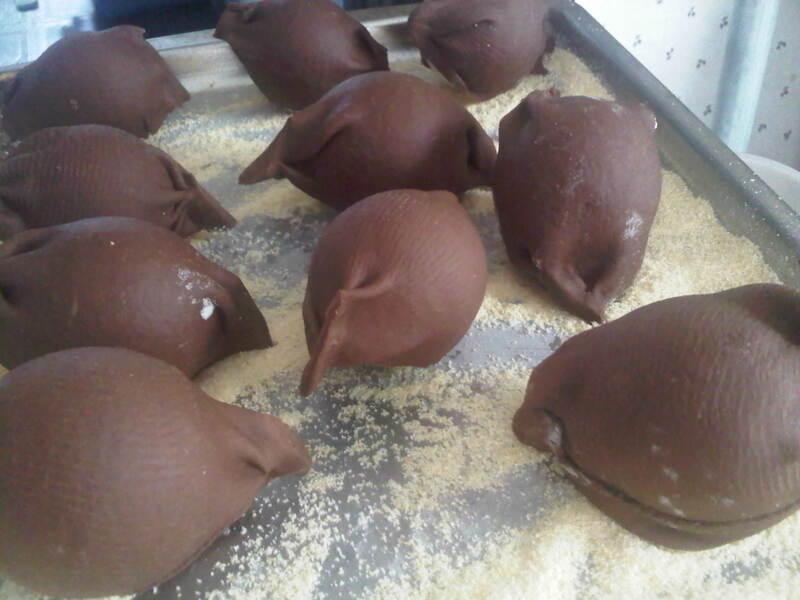 I went back to plan A. I would have to make a chocolate shell out of pasta dough. I looked up recipes on the internet for chocolate dough and found one that seemed simple enough. It was just like regular pasta dough only 1/4 cup of flour was exchanged with 1/4 cup of cocoa powder. My next obstacle. How the heck was I going to make a shell? This one took me some time to figure out. I asked around and even though many good ideas were given to me I didn’t have enough supplies to make as many as I wanted. While I was rummaging through the “junk drawer” I came across a bag of water balloons. LIGHTBULB! I decided to blow up the water balloons to the desired size of my chocolate shell then I would just pop the balloon when it dries. I won’t lie – I felt pretty brilliant. 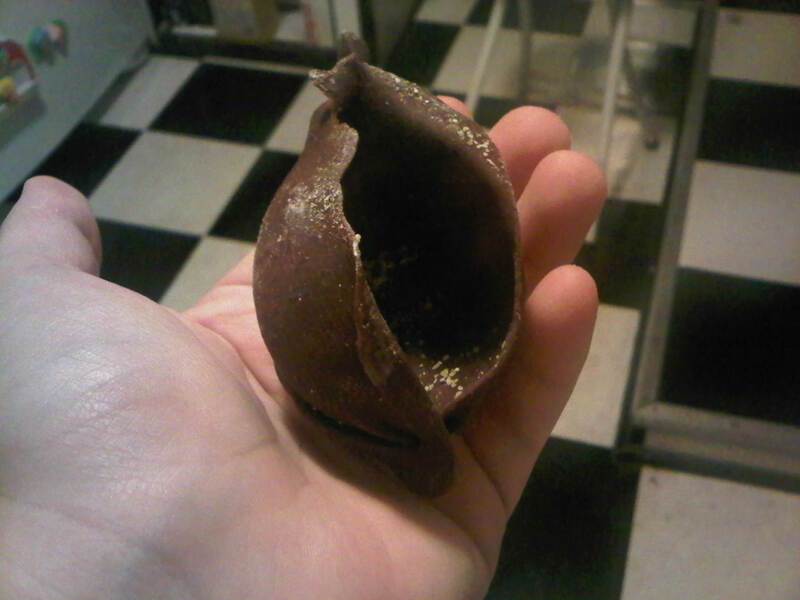 Those were my first attempts at making my chocolate shells. Sadly, they came out much better than my second attempt! But that’s okay, I accepted that. My next plan was stuffing. I still wanted to stick to the basic recipe for stuffed shells. I knew I needed to use ricotta. I came across a recipe on the internet for Ricotta Mascarpone filling that was meant to go into a cannoli. I had to leave out the lemon juice since I have a severe citrus allergy – however I do feel the filling was missing an acidic taste to it so I do suggest that if you were to make it to definitely add the citrus. I did cover the stuffed shell with a strawberry sauce which added some acidity but I feel that more acid in the filling would have made it that much better. I came to the party confident in my brilliant idea. To be honest though – that’s all I was confident in! I felt that I had a completely brilliant out-of-the-box idea but I was still concerned about how the pasta dough with a dessert would work out. 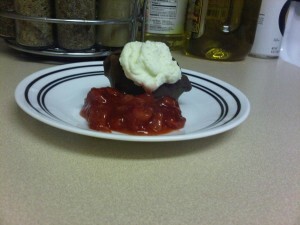 The dish presentation was beautiful – the filling tasted awesome and so did the strawberry sauce. But to be honest I really couldn’t get pasta the pasta texture with my dessert. I had joked saying “I don’t like my desserts being al dente”. I do feel that it’s a recipe I can play with and maybe perfect some day. I do feel that if it was a chocolate shell (minus the pasta part) it would have been amazing. I knew that if I didn’t do pasta or ricotta I would have been considered a cheater and that’s when I went that route. I do not feel it was a complete flop – it was just different! Make just like any other pasta. 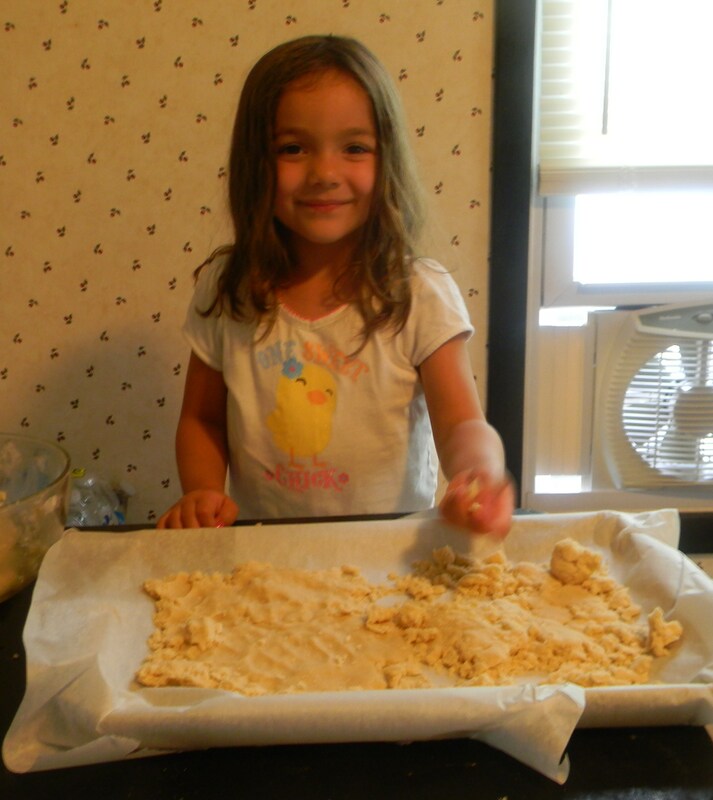 Make your well with the dry goods and add the wet in the middle until you form a dough ball. Let it rest before rolling out. Process the ricotta , mascarpone, and sugar in the bowl of a food processor until smooth and creamy. Transfer to a mixing bowl. Stir the zest and vanilla into the ricotta. Whip the heavy cream with the powdered sugar to stiff peaks. Stir a small amount of the whipped cream into the ricotta mixture to lighten it. Add the remaining whipped cream and gently fold together until well combined. Strawberry Sauce – I don’t really have a recipe for this! I just cut up fresh strawberries then cooked them down with some sugar, a little water, a splash of vanilla and cornstarch if needed. I’m pretty bad when it comes to bargain buys. If I am grocery shopping and there’s an insane deal on a certain item I can’t help but to pick it up. I may not have any idea what I will be doing with it – I may not even have the will to cook that day – but it must go home with me. I realized that this must be a genetic disorder. Today I went to the grocery store with my mom when she excitedly asked me If I could make a blueberry dessert since there was such a great deal on blueberries! Of course I had to stop her from picking up the other berries that had been on sale since I didn’t really feel like cooking today anyhow (please ignore the fully cooked rotisserie chicken and container of scalloped apples in my cart – eh hem). I decided that I would be a nice daughter and make my mom some blueberry cobbler – the “cheaters” way. As I mentioned in a previous post, I DESPISE flour. I didn’t feel like making a pie crust top, or even a nice fluffy biscuit like topping – this would mean I would have to touch flour. I decided to mix up a little of this and a little of that without having to use an overwhelming amount of flour. Which by the way, anything over one cup of flour becomes an overwhelming amount of flour. This is what I came up with! 1. add blueberries, sugar, cornstach, vanilla, and desired amount and water and cook down until blueberries have turned syrupy. 2. While waiting on the blueberries combine all ingredients except honey in a mixing bowl. I find it easier to crumble up in my hands and combine like you would a pie crust in its first stages. I added honey last – purely for the sake of I didnt want my hands to get that sticky (Sorry OCD talking). 3. 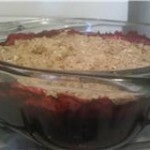 Transfer blueberries to a baking dish and sprinkle the oat mixture ontop evenly. Place in a 350º oven until top is lightly browned. I left mine in just under 30 min. Baking – My love/hate relationship. I didn’t think I would have a topic to share with you all today, but I was going through pictures on my phone and had an ah-ha moment. I took a picture of a big batch of cookies I made today and smiled from ear to ear. I absolutely…positively…hate baking. I had a flash back of making this batch of cookies. Flour flying, reviewing my recipe with dough filled fingers, washing my hands eighty thousand times to get all the flour bits off, egg shells oozing onto the table. I hate baking! It’s too messy and since there’s this crazy ‘science’ to it I feel like it doesn’t let me be free. I feel trapped in this world of you MUST do it this way. 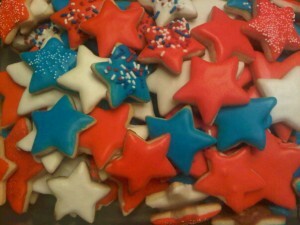 I admit I did rebel – I used almond extract instead of vanilla..Ha! Take that baking! Maybe its just a bad case of OCD but the idea of flour being stuck to every crevice of my body just drives me insane. You may be wondering – how do you manage to get flour all over? Answer is..I have no idea. I think its some conspiracy against me and the baking Gods. They seem to know that flour and powdery things are my pet peeve and they just stick to me like magnets. As I mentioned before I also don’t like being so restricted to recipes. When I cook I just analyze what I have to work with and then I make something. There’s no paper getting involved in my relationship with my ingredients. I know that to seasoned bakers recipes may not mean much to them either. But unless there’s some sort of invention to keep the flour away from me I don’t think I’ll ever reach that point. Here is where the love part comes into play in the love/hate relationship. When all is said and done and the flour is cleaned up and the recipe is crumpled up in the corner of my counter – I have an end result that is beautiful. I have made cakes and felt violent the entire time but when I see the end result and know that I made that – all is well in the world. That is how i felt when I made my cookies today. I know that in the moment I felt depressed, angry, sticky and had so much flour on me I felt like a human dumpling – but hours later when the product is looking all pretty on my counter I forget that making that drove me absolutely insane. I think I will continue to hate baking the rest of my life but I will continue to do it despite my harsh feelings towards it. Baking you can go to hell – but I’ll see you again someday.